In an endeavor to keep the rich history and memory of Gordon High School alive, I will periodically devote my column to achieving that task. Unlike many African-American high schools in the Pee Dee and beyond that ceased to exist due to the gradual implementation of integration (which was determined by the Supreme Court to be the law of the land through the decision rendered concerning Brown vs. The Board of Education of Topeka, Kansas back in 1954), to our failing (and perhaps shame) as alumni and graduates of Gordon High School, we have done a terrible job of maintaining our heritage and history. To their credit, there is a special group of Trojans who have worked hard to organize and sponsor some yearly events for people who either graduated from or attended Gordon High School in an effort to keep the memory and history of our dear alma mater alive. Special thanks must be given to people like Mrs. Hattie McInnis Barnes, Mrs. Alma Lucy Mack VanBuren, Mrs. Joan Bethea, Mr. Fitzgerald Lytch, Mr. Ray Bethea, Mr. Bruce Page, and others who are all loyal Trojans, who have done their level best to maintain the memory and legacy of Gordon High School. I had to give much thought to which of the many graduating classes of Gordon High I would feature in my column today. The Class of 1967 won over a few others that came in a close second and third. Perhaps my decision was prejudice by the fact that my older brother, Marvin, was the president of that remarkable class. Also, the compelling truth for me as a ninth grader at Gordon High in 1967, was the fact that class was loaded with many gifted, talented, and even devious characters who left an indelible mark in my memory. 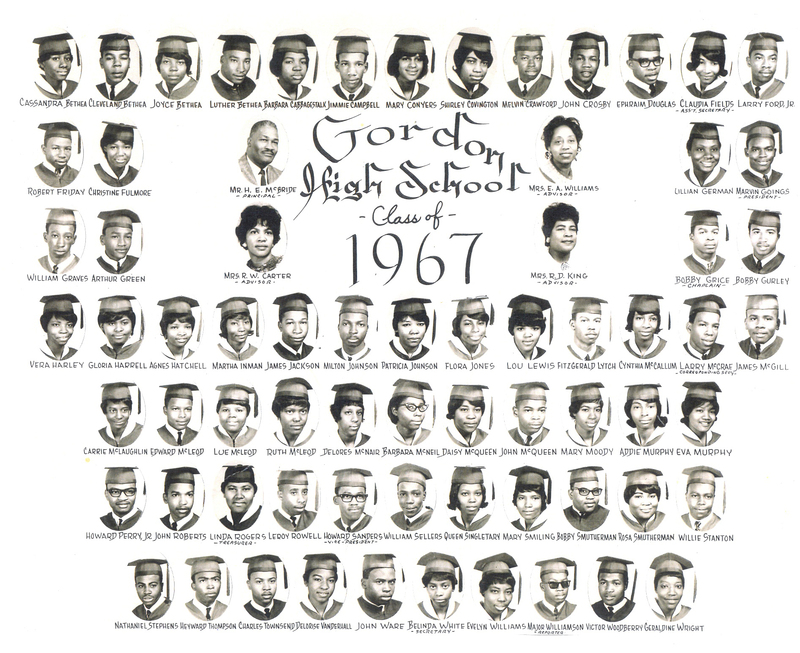 Perhaps more than any other class that ever graduated from Gordon High School during its brief history, the Class of 1967 was the class of greatest diversity, intrigue, and even tragedy. I will begin giving some historical facts about this class by citing some of their most outstanding students and scholars. Since the primary purpose of going to school is to get an education that will give you a foundation for the next level of life, whether it is college, the military, or workforce, everyone needs at least a high school diploma from an accredited school. 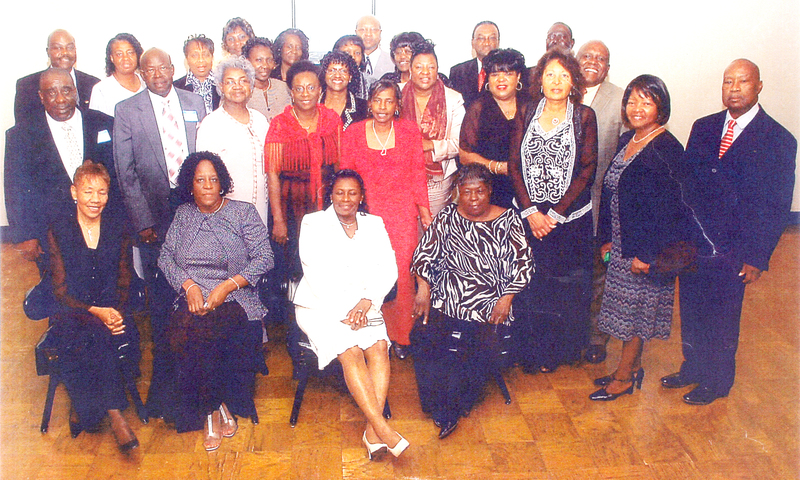 The Class of 1967 was one of Gordon’s most accomplished classes according to their average and collective G.P.A. Though they did not produce the likes of Jimmy Jones, Kenneth Manning, or Carnell Cooper (all of whom have stellar careers in their given professions), as a class, they stand out with the best of the best that Gordon High ever produced. Now it is impossible for me to include everyone who was in the top ten percent of this amazing class academically, but I will name the top three. Bear in mind that they lost arguably their greatest scholar to Dillon High School when he transferred his junior year. His name was David Brunson Manning, the younger brother of Professor Kenneth Manning. His G.P.A. was the highest in the class when he transferred to the white school who mysteriously chose not to select a valedictorian or salutatorian for 1967. Due to the fact that I was brought up in a family where playing sports was almost a mandatory thing, all three of my brothers were starters in all of the three team sports played at Gordon. Perhaps the most compelling reason why sports was so popular at Gordon High School was due to the impact and influence of Coach Paul J. Glenn. Mr. Glenn served as the head coach of all three male sports teams (football, basketball, and baseball) and compiled an impressive record of wins, conference championships, as well as two state championships (one in baseball and the other in basketball) during his tenure at Gordon. The amazing thing about Coach Glenn was that he accomplished all of this almost single handedly while serving as a history teacher, the athletic director, and Booster Club president. There were many outstanding athletes in the Class of 1967, like John Henry Ware, Victor Woodbury, Macio Williamson, Bobby Grice, John Crosby, Nathaniel Stephens, Fitzgerald Lytch, and of course, the big three: Cleveland (Jungle Baby) Bethea, Luther (Pudgy) Bethea, and Marvin Goings. These three stood out in this class of outstanding athletes due to the fact that they played, started, and were stars in all of the three male sports teams at Gordon. They were very instrumental in helping Gordon to win the 2A State Championships in basketball as juniors in the years of 1965 and 1966 and in football their senior year in 1966. Besides being a very academically accomplished class with one of the highest collective grade point averages, as well as the most athletically inclined, which was proven through the fact that they won two state championships, the Class of 1967 was a class with cool dudes and style setters, especially the males. Maybe it was due to the fact that I was a ninth grader and had never seen guys dress and wear the kind of clothes that many of them wore to school. They routinely wore clothes that you would expect people to wear only on Sundays or at some special occasion. It would be customary to see fellows like Willie Stanton, Charles Townsend, Ephraim Douglas, Bobby Gurley, and a few others come to school with starched shirts, creased pants, blazers, spit-shined, old-man comfort shoes, and topped off with waves in their hair that would make some of the girls desire to be spooned and some of the fellows just a tad bit jealous. Perhaps, I was one of the guys who contended with the green-eyed monster over the popularity and attention that these cool dudes and style setters were getting. I have reserved the worst for last about this absolutely unforgettable class that produced many prominent and successful people in their given professions and pursuits. This class can boast of having produced two full bird colonels in the persons of Bobby Grice (Marine Corps) and Leon Page (Army Chaplin). Macio Williamson, who was voted the most popular male in the class, served as our longest tenured black county councilman. Then, let us not forget about the ones who have made their mark in education and corporate America. Added to the many achievements of this class is the fact that perhaps the richest African-American that Dillon ever produced, who is a bona fide multi-millionaire, was a member of this class; however she left during her junior year to live in Maryland with her aunt. Nevertheless, however talented, intelligent, and successful this class was, they had a dark side. Guys like Cleveland (Jungle Baby) Bethea, Luther (Pudgy) Bethea, Baron Alford, and a few others were quite devious, defiant, and vandalistic at times. It was not uncommon to hear a cherry bomb explode in the hallway while classes were in session. Arguably, the greatest indecency and insult committed by someone in this class was the release of a big pile of human feces on a teacher’s desk that they had an ought against. Mr. Henry McBride, the last principal of Gordon High School, was quoted as saying that he could not handle another class like the Class of 1967. Like all things that must come to an end, the school year of 1967 finally came to an end; it was a bittersweet end. On one end of the spectrum, it was the end of the school year of Gordon High’s most remarkable and unforgettable class. At the other end, the Class of 1967 lost two of its most favorite sons tragically in an automobile accident when they both were home from college their freshman year during the Christmas holidays. Both Cleveland O. Bethea and Baron Alford suddenly lost their lives at a very untimely moment when they had so much to live for. Special thanks must be given to Mrs. Delores McNair, who was a very popular member of the Class of 1967, for her assistance in helping me with the facts and photos about this class.